In a large skillet, cook bacon until crisp. Crumble bacon, set aside. Heat oil in skillet . Combine potatos, onion, and sweet pepper; pat into skillet. Cook, uncovered , over low heat about 7 minutes or until crisp and brown, turning once. In a small bowl, beat together eggs, milk, salt and black pepper; pour over potato mixture. Top with cheese and bacon. Cook, covered, over low heat for 5-7 minutes or until egg mixture is set. 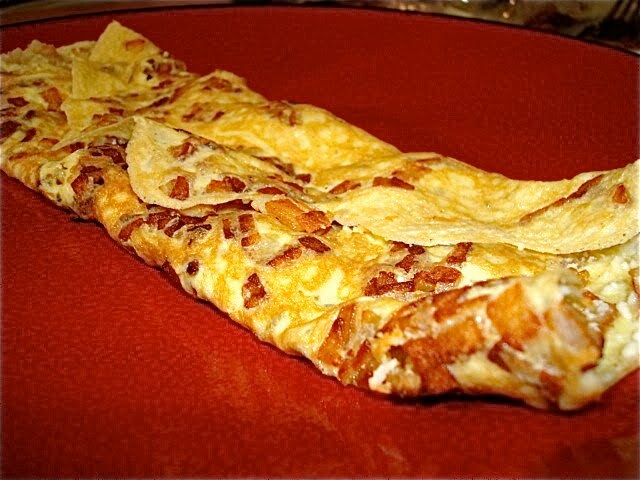 Loosen omelet from skillet; fold in half. Turn out of skillet onto a serving plate. To serve, cut into wedges. ****if using bacon, omit cooking oil and use bacon drippings.